NBA: Damian Lillard had 27 points and a season-high nine assists as the visiting Portland Trail Blazers used a big first half to rout the Denver Nuggets 130-113 on Wednesday night. 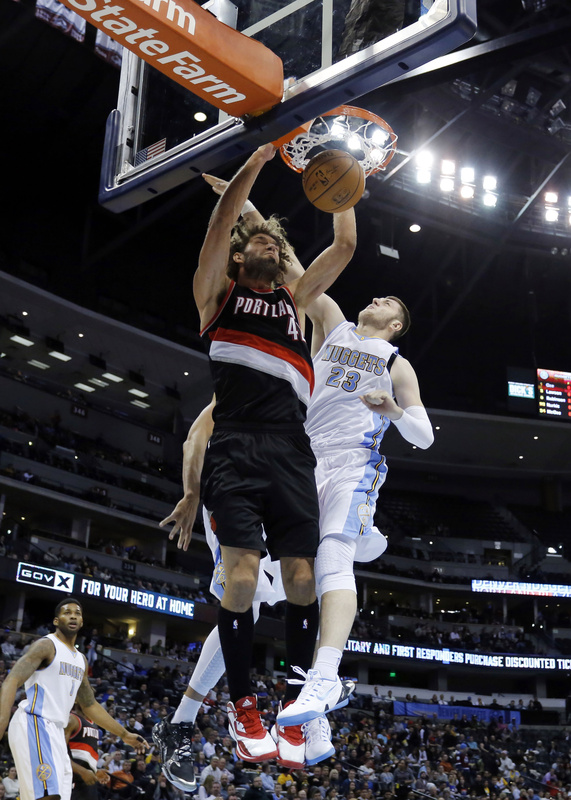 The Blazers scored 84 points in the first half, one basket away from matching the team record for a half (86) set against Golden State on Jan. 5, 1986..
Robin Lopez scored 15 of his 19 points in the decisive first half. LaMarcus Aldridge usually gives the Nuggets nightmares, but he was largely kept in check, finishing with 12 points. Ty Lawson had 32 points for the Nuggets, who dropped their sixth straight game. • Wizards defeat Pistons: John Wall had 27 points and 11 assists as Washington pulled out a 107-103 win over visiting Detroit. The teams traded the lead on five consecutive baskets before Wall’s jumper with 1:11 to play put the Wizards ahead 101-100. Marcin Gortat, who had 13 points and 14 rebounds dunked with 38 seconds to play, giving Washington a 3-point lead. • Hawks sink Jazz: Paul Millsap had 30 points and 17 rebounds and Jeff Teague added 17 points to help Atlanta beat visiting Utah 100-97. Kyle Korver’s 3-pointer from the left wing with 58 seconds to play put the Hawks up 100-97 and marked the game’s 18th lead change. • Pelicans beat Lakers: Anthony Davis had 25 points, 12 rebounds and six blocked shots, and New Orleans pulled away from Los Angeles for a 109-102 home victory. • Thunder handle Celtics: Reggie Jackson had 28 points and eight assists, and Anthony Morrow scored 28 to lift Oklahoma City to a 109-94 road victory over Boston. • Pacers push past Heat: Chris Copeland scored 17 points and put Indiana ahead to stay on a layup with 43 seconds left, Roy Hibbert added 16 points and 15 rebounds and the Pacers beat host Miami 81-75. • Magic finish strong: Evan Fournier scored a career-high 28 points and visiting Orlando handed the New York Knicks their sixth straight loss with a 97-95 victory. Nikola Vucevic added 20 points and 13 rebounds for the Magic. • Suns rally past Nets: Gerald Green came off the bench to score 28 points as host Phoenix erased a 19-point deficit to beat Brooklyn 112-104. • Rockets take down T-wolves: Dwight Howard had 22 points and 10 rebounds, James Harden added 23 points and 10 assists, and Houston beat Minnesota in Mexico City 113-101 in the NBA’s first regular-season game played south of the border since 1997. NHL: Phil Kessel scored twice, and host Toronto netted four goals during a nine-minute stretch to chase Vezina Trophy-winner Tuukka Rask and rout Boston 6-1. Kessel now has 10 goals this season. Morgan Rielly, Tyler Bozak, James van Riemsdyk and Peter Holland also scored for the Maple Leafs. Jonathan Bernier was solid in making 25 saves despite not being tested much. • Ducks outlast Kings: Ryan Kesler netted two third-period goals and scored again in the shootout, leading Anaheim past Los Angeles 6-5 in the first Freeway Faceoff of the season in Anaheim, California. Ryan Getzlaf scored the tying goal with 1:39 left in regulation to force overtime. Jason LaBarbera made two stops in the shootout on Jeff Carter and Anze Kopitar. MISCELLANY: Novak Djokovic withstood an early assault from Stan Wawrinka, and then crushed him 6-3, 6-0 at the ATP Finals in London to close in on the coveted year-end No. 1 spot. “I thought he played very well the first two games. But I wasn’t frustrated. After that, it was a really amazing performance,” Djokovic said after extending his unbeaten run indoor to 29 matches. Djokovic will be guaranteed to finish top of the rankings for the third time in four years if he wins his final round-robin match at the elite tournament against Tomas Berdych. He has two wins in Group A, while Berdych posted his first victory against debutant Marin Cilic. Berdych, who lost his opening match to Wawrinka, recovered to stay in contention for a spot in the semifinals by beating Cilic 6-3, 6-1. • MLB All-Stars shut out: Kenta Maeda pitched five scoreless innings as Japan defeated the Major League Baseball All-Stars 2-0 in the first game of five on tour. Maeda, who has expressed an interest in pitching in the major leagues, gave up two hits while striking out two and walking two. The only hits conceded by Maeda were a single to Seattle’s Robinson Cano in the first inning and a double by Dexter Fowler in the fifth. The five-game series resumes Friday when Mariners right-hander Hisashi Iwakuma starts for the MLB team in Tokyo. • Tigers sign Martinez: Multiple reports say the Detroit Tigers have reached agreement on a four-year, free-agent deal with slugger Victor Martinez, keeping the 35-year-old designated hitter in the middle of their lineup following perhaps the best season of his career.